Presented below is a comparative history of world war 2 facts, set by region and time, that captured the attention of policy makers and military planners on every continent. The aggregate of these facts ultimately engaged the world in a global war. Empires that were built over centuries would crumble in a seven year span. The United States, a relative newcomer to the international scene, would emerge as the sole world power, and added a new chapter in its history. Adolph Hitler and Hideki Tojo create a world war. They formed the core of the Axis countries. September 1: Germany attacks Poland and British send Expeditionary force to France. September 17: Soviet Russia invades Poland and it surrenders 11 days later. November 30: Soviet Russia invades Finland against stiff resistance. January: German U-Boat sinks British destroyer and lose 135 sailors. Adolph Hitler appoints Reinhard Heidrich to plan solution of the "Jewish Question". February: Soviet Russia agrees to supply Germany with grain. Hitler orders unrestricted submarine warfare. Allied shipping suffers heavy losses through the year from both submarine and surface war ships. Germans plan to invade Norway and France. March: Finland surrenders to USSR (United Soviet Socialist Republics) after 100 day war. April 9 : Germans execute Polish officers at Katyn. Germany invades Norway and Denmark---Denmark surrenders. British and French troops then land in Norway--and remain less than one month. British capture U-Boat and uncover German code books and Enigma coding machine. May: Germany attacks Netherlands, Belgium, Luxembourg and France. Each present a spirited defense (ex Luxembourg) but all will surrender, b France holds out until June 22. French Vichy government makes pact with Germans. British and French forces cornered on Dunkirk beach in north eastern France. June: Germans seize Channel Islands. 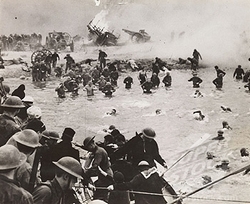 British and french forces (340,000) evacuated from French beach by English "Little Armada". July: Germans plan invasion of England. ("Operation Sea Lion") that never is executed. Royal Navy destroys French Fleet off Algerian coast and French retaliate and bomb Gibraltar. U.s, activates General Headquarters to mobilize and army and train recruits. Luftwaffe begins air war over Great Britain. August: USSR invade Baltic countries. Heavy German bomber losses over England, but their big guns on French coast bombard English coast. September: U.S. institutes Lend Lease program and transfers 50 destroyers to Great Britain in exchange for U.S. bases in British possessions. Italians bomb Tel Aviv in British Palestine Mandate. U.S. begins first peace time conscription. German air "blitz" over Britain begins. October: German herd Polish Jews into Warsaw ghetto. Germany occupies Romania and forces alliance. 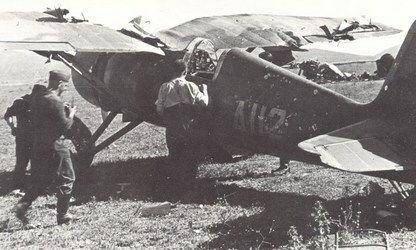 Italians bomb Cairo and American oil fields in Bahrain (Arabian coast). President Roosevelt's pre-election promise not to send Americans to war. November: British fleet destroys Italian Mediterranean fleet. December: Spanish dictator, Francisco Franco rules out war for Spain. 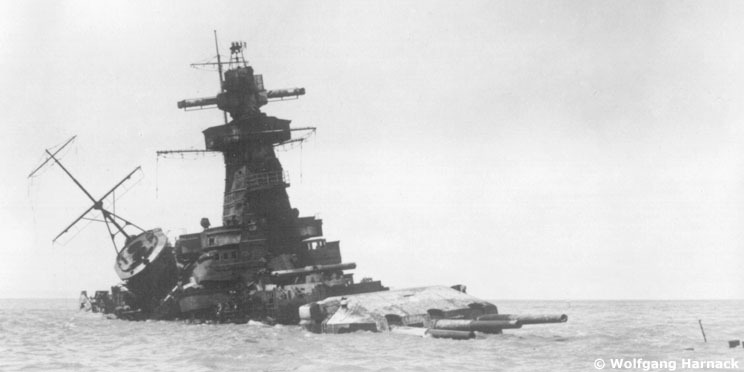 British navy corners German pocket battleship, Graf Spee, with many British kills in its record, off Uruguay, and forces German ship's captain to scuttle ship. Greeks defeat Italian 9th Army. October: Chinese Nationalists on Chinese mainland counter attack cause heavy Japanese losses, but also suffer heavy casualties. 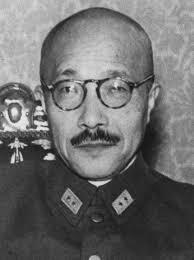 November: Chinese mount large attack led by Chiang Kai-shek. January: Chinese and Japanese in a stalemate. September 27: Japanese enter into alliance with Germany and Italy (Tripartite agreement). September: Japanese force French government to give them access to northern Indochina. In one year, they will occupy the entire peninsula. 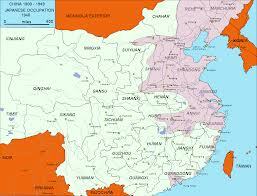 Area of Japanese occupation in China. February; General Erwin Rommel's Afrika Korps land in North Africa to salvage Italian defeats. By April attack Tobruk. March: British troops land troops to support Greek army. Roosevelt signs new led-lease bill. April: Germans invade Yugoslavia and Greece. Both countries surrender days later but partisan forces continue war. May: Royal navy sinks German battleship, Bismarck. Italian forces surrender in Ethiopia. June 22: Germany invades USSR in Operation Barbarossa. British and Free French ally enter Damascus, Syria which Vichy French forces abandon. July: British and Russians sign treaty in London to further mutual war aims. November: Germans advance on Sevastopol and Moscow. Sevastopol surrenders July 4. December 11; Germany declares war on United States. December 19: Hitler takes control of German army. September: Chinese counter attacks score victories over Japanese at Changsha. However, Chinese Communist forces cease cooperation with their nationalist counterparts. November: Japanese fleet leaves homeland waters to embark on 4,000 mile route to attack Americans at Pearl Harbor, Honolulu. December 7: Japanese bomb Pearl harbor American naval ships and facilities. December 8: United States and Britain declare war on Japan. January: Hitler blames reverses in Russia on the weather. Heavy air attacks on allied stronghold in Malta. U-Boat offensive off U.S. east coast. February:Rommel's forces reach Egyptian border. Soviets drive Germans from Kursk. U.S. Army Air Corps sets up English bases. First meeting of U.S. military to plan overall war strategies. German battleships and cruiser break English Channel blockade and reach safety in northern ports under their control. SS Normandie destroyed by fire at New York dock. Conspiracy theories unproved. March: British commandos in cross channel raid on French port of St. Nazarre--suffer heavy casualties but effectively destroy the port. April: U-Boat sinks first American naval vessel. SS Roper. Hitler prevails upon Mussolini to send 7 Italian divisions to the eastern front. They were ill fated. May: U.S. 1st Armored Division lands in Northern Ireland. They will see action in November in North Africa. 1000 RAF bombers destroy Cologne. June: Mexico declares war against Axis tripartite nations. U.S. bombers hit Romanian oil fields. Rommel's forces within 70 miles of the Nile River, and his troops also retake Tobruk. Nazi general, Reinhard Heidrich, assassinated in Czechoslovakia. Eisenhower appointed commander of all U.S. forces in Europe and North Africa. July: British engage Rommel forces that attack at El Alamein. Germans stalled by lack of ammunition. British led by General Auchinlech. Vichy French aid Nazis in deportation of 13,000 Jews to Auschwitz. Messerschmidt tests first jet engine. U-Boats withdrawn from American east coast because of heavy losses inflicted by well protected convoys. August: British and Canadian infantry commandos in a cross channel raid on port of Dieppe is a total failure. 3000 casualties out of 6000 force. Allies supply their beleaguered base on Malta which was suffering from heavy German air attacks. September: Germans reach outskirts of Stalingrad. American volunteers in RAF Eagle Squadron transferred to U.S. Army Air Force. October: Second Battle of El Alamein is a total Allied victory. November: Tide turns in North Africa under leadership of General Sir Bernard Montgomery. In one month his forces push Rommel from Egypt and recapture Tobruk and Benghazi. Allied forces land in Morocco and Algiers, and open North Africa drive in Operation torch. December: Allies trap Germans in Tunisia in absence of Rommel away on medical leave. January: Manila falls to the Japanese. Japanese attack Bataan peninsula and encircle American forces. Kuala Lumpur, Malaya falls to Japanese forces. Entire country will fall within 2 months. British troops in Indochina start withdrawal to Singapore which surrenders within a month. Japan declares war on the Netherlands and invades her East indies territory. Japan takes Rabaul on island in New Guinea chain and now a threat to Australia. February: Internment plan of West coast Japanese residents will begin shortly, and exclusionary zones setup on U.S. east coast for Americans of German or Italian descent. Japanese invade Burma and Rangoon falls. Japanese sink 6 U.S. destroyers and 5 cruisers in Java Sea and then invade Java. March: Pres. Roosevelt orders General Douglas MacArthur to leave his post in Philippines which will shortly fall to the Japanese. April 18: Lt. Col. James (Jimmy) Doolittle leads B-25 air aid bombing 4 Japanese cities including Tokyo. Japanese navy enters the Indian Ocean and bombs Ceylon. Burma Road cut by Japanese effectively closing American operations in that zone. May: Corregidor Island surrenders to Japanese. Americans starving and sick unattended. Philippines about to fall. Battle of Coral Sea. Casualties on both sides high in action in which the combatants ships were 100 miles apart. June: Americans successfully defend Midway. 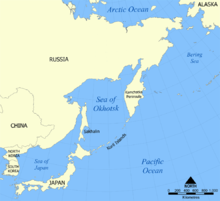 Japanese occupy Kiska and Attu in American Aleutian islands. Not since War of 1812 has American soil been occupied by a foreign power. July: Japanese occupy Guadalcanal and U.S. aerial observation notes that Japanese work on airfield construction begun. August: 1st Marine Division, 10,000 men, attack Japanese on Guadalcanal and Tulagi as part of large air, sea land battle. In 24 hours, Marines take airfield but this merely signals a battle that does not end until following February, 1943. 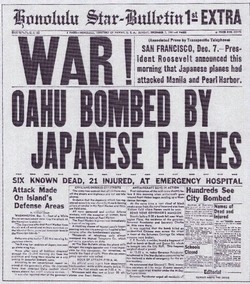 September: Japanese plane drops incendiary bomb on Oregon with no appreciable affect. Combined forces of Australians and Americans defeat Japanese on Papua in first land war victory in the Pacific. October: U.S. Navy inflicts heavy damages to Japanese fleet at Cape Esperance. Admiral William Nimitz appointed commander of South Pacific fleet. November: USS Juneau sunk off Guadalcanal with heavy loss of life including 5 Sullivan brothers. December: U.S. Marines relieved by army infantry on Guadalcanal.